Finding cheap furnace rental services can be a tough challenge especially when you are looking for good quality, quick replacements and high efficiency. However, furnaces for sale in Toronto offered by the leading HVAC contractors is the easiest alternative to find high efficiency heating equipment. Here are 5 tips for Toronto residents on getting superlative deals on best furnace rental packages for your home and office. When it comes to performance, furnace rental services equate it with high efficiency and warranty period. Some buyers prefer to buy cheap rental services overlooking the performance part. A high quality furnace not only delivers excellent service in heating during winter season, it also saves thousands of dollars. The savings from the furnace operation far outweigh the initial rental cost of the furnace air conditioner systems with highly optimised performance during peak hours. Modern furnaces for sale use propane and natural gas as the heating fuel. In Canada, high performance gas furnaces available on sale are anywhere between two to five years old with excellent reports. With low operating cost associated with the propane-fuelled furnaces, HVAC contractors Toronto supply them to urban areas and residential societies in the neighbourhoods. A new furnace for sale running on propane gas would cost you 25 percent lesser compared to the electric ones. Most furnaces for sale and rental are available on lease for a flexible period. The best part about choosing such services in Toronto is that you pay no additional cost as a customer on new HVAC systems. With a simple application, you can grab the best in line furnaces for a period of one month extendable to up to one year or more, depending on your payment record and maintenance. Longer the term of your rental service, cheaper will be your upfront cost. Best HVAC contractors Toronto even offer free or discounted furnace and ductwork installation services. 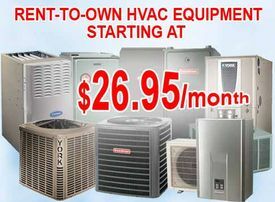 When it comes to renting or financing an owned furnace in Toronto, it is better to opt for flat monthly packages. The package covers extensive maintenance and replacement services, with no additional cost of servicing. Secondary option is to pick a progressively cheaper rental package that is based on the performance of the furnace, number of break-down maintenance and also the age of the unit. If you are picking the unit for residential heating, flat rates are most preferable considering the length of the term and your budget. It is always a great thing to look beyond the brand name. If you are looking for a good service out of the furnace rental unit, do some research on the functionalities, advanced features, and the cost of installation as well, apart from the usual brand name! A hastily installed furnace rental could give you trouble in the future, with irregular functions and persistent breakdowns. Save the risk and avail the recommendations on furnace rental units from HVAC contractors Toronto.